Tonight is the big release night at TSG and I know I will be making a purchase so, "rule of thumb" before doing so, is to use the stamps from last release! 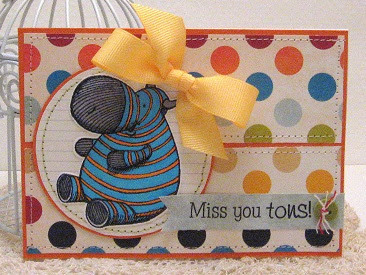 This cutie "Gloria" is the focus of this card! :) This week's challenge was to use this sketch and she fit perfectly! DP's from Fancy Pant's, cardstock and ribbon from PTI, misc. button and baker's twine. Adorable! I love how you colored in Gloria! Thanks for playing along with us at TSG - hope you will join us for a new challenge tomorrow!